If you need to establish facilities outside of Denmark – permanent or temporary – DC-Supply also delivers custom container solutions to anywhere in the world. 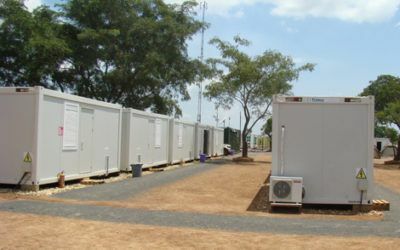 We have many years of experience in adapting container units to even very specific and sometimes extreme climatic conditions. No matter if for operation in very high or very low temperature climates – we can design and build for the situation. Furthermore, we are specialists in producing functional custom container solutions for geographical conditions that are difficult to access and perhaps do not offer the possibility of connecting to the grid otherwise – lack of sewerage or electricity supply connections for example. Oil drilling in Uganda takes place in remote areas where residential facilities are lacking. For several years, Mineral Services has collaborated with DC-Supply for the supply of equipment for local residential camps. Container solutions abroad need not be cumbersome – when you work with DC-Supply, you get a cost-effective solution delivered on time, at the right place. Be it a CSC certification for sea transport or other types – If there is a need for specific certifications, we will make sure that your specific solution gets certified. Often – we send our own experienced crew to manage the setup of the container solution abroad. This way, we ensure that the project is delivered in full on to our own high standards from start to finish. If your company needs a container solution abroad, feel free to contact our experienced staff for a chat about opportunities and clarification of any geographical or transport issues. We are serious about close customer dialogue and collaboration and will gladly help you with your next custom container project abroad.